Thanks for adding the 2nd number which is now showing on my Manage Users screen. Sadly husbands phone is still showing No Signal. He got the SMS while we were out today confirming he had been added but now we are home, no luck. I have reset the VSS and reset his phone (separately and together) and no joy. He has an iPhone 4 (not a 4s) and it has been working perfectly with this VSS for over a year until yesterday. @jeffml, I can see that the location profile has been updated however, it doesn’t look like it has re-synced after the change has gone through, I have re-synced your Sure signal (40110917768) for you now, please can you give this an hour and let me know how you get on. @Pineau, I can see that your Sure Signal (21197186378) has been re-synced this afternoon for you, please can you let me know if you notice any changes after this has completed. Yes. We rang the helpline again this pm and the nice man reduced the VSS. As of about 5 minutes ago we are BOTH connected and life is good again. Thank you. Even though the problem was really frustrating I have appreciated the positive attitude and quick response from the vodafone helpline and tech team people. That should of course say resynced not reduced ^ ! I tried resyncing and resetting and now just sits with only the Power light lit. Nothing else. I've reset my router and DSL modem and then restarted the Sure Signal and gave it a few hours each time but the same status. I'll let it sit overnight and see if it comes back to life. Still nothing this morning. Tech Team, could you please check if you see something wrong? First of all, I must say that I'm really disappointed by the need for Sure Signal, the very device and this website. One would expect that the Vodafone network would have decent coverage in SW London, but in our ground floor flat we have almost no signal. So off to buy the Sure Signal box (spending another 50 quid)... which finally arrives to the Vodafone store a week after ordering. Picked it up, it then turns out it doesn't work with my Blackberry. "Sorry, we're having a technical problem at the moment. Please try again in a few minutes. If you keep seeing this message, please contact us through the help centre." Called the help center by phone on Saturday, who stated they cannot access my account as it's a Bank Holiday weekend..
Saturday the Dasboard worked, today it's showing that it's "impossible to process the request." So here you go, I hope you lot can help us out. Thank you for your post and for keeping us updated. I have checked and all seems well at this end, please can you perform a speed test and a ping test and post your results back here, please can you also provide us with your external IP address. I am sad to see you are having difficulties with your Sure Signal and I would love to assist you with this. I have resynchronised your device, please can you let me know how you get on after an hour. If you are still having difficulties please can you also perform the tests above and post your results back here. I can get you a wireshark capture if that helps. Thanks for getting those screenshots for us. The speed test shows the download speed particularly is pretty close to the minimum recommended, so this could cause issues with the Sure Signal, especially if something else is using the bandwidth at the same time. That said, with one line working the connection is less likely to be the issue. The IP address is also whitelisted so there's nothing of concern there. Given that one number seems to work OK but not the other, can you confirm for me what exactly happens with the Sure Signal lights when your wife tries to make a call for me? Also, can you swap your SIMs over and see if the issue follows the SIM or the handset? I think you missed my post from earlier. None of the lines are working now. All lights are out execpt for the power light. Watching with wireshark I'm able to see it has an active VPN (ESP traffic back and forth with 212.183.133.179) but never brings up service. When I reset the device yesterday (holding reset button while powering on) I was able to watch it establish the VPN and download new firmware (I assume) and then reset itself with the new firmware. Obviously I can't see anything besides IP traffic but can you see on your side what the status for my device shows? 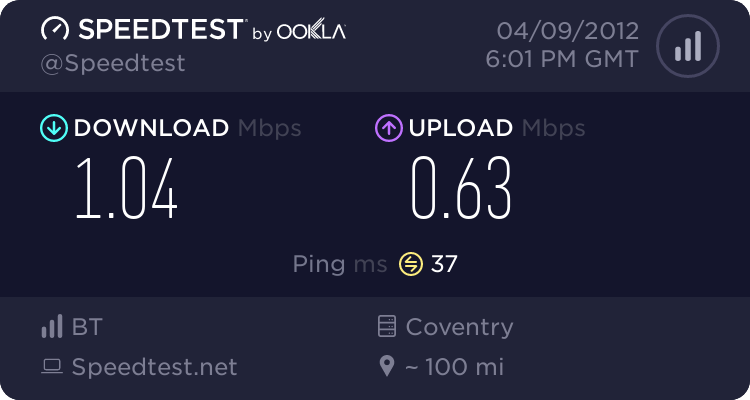 If I’m honest, you connection speed is so close to the limit, it could be this that is causing the issue. I really need to see some stats on the connection quality. Can you perform a traceroute for me please? If possible, do a couple throughout the day so we can get a couple of examples. 7 20ms 0/ 100 = 0% 0/ 100 = 0% acc2-10GigE-10-2-0.sf.21cn-ipp.bt. Hi, I used to use my Sure Signal but then moved to a different network. Have just returned to Vodafone but when trying to reregister my SS2 it says it is already registered. I cannot log in as my previous Mobile Number's account was closed - so I need it deregistering. Thank you for this information and this also appears to be present and correct. The last thing we need to try before looking at our options and to check the device is not faulty iss to try the Sure Signal at another location, please can you derigister the device and try this and let us know how you get on. Thank you for your post and a very warm welcome to the eForum. I can see from your Serial Number that the details registered to the Sure Signal, so we can complete security and assist you further please follow the Private Message I have sent to you and we will be in touch as soon as we can. It is up and running right now! Wife says it was online since this morning. Both phones working. I'll take it even if we can't pin down what the problem was. Thanks for the troubleshooting anyway. Many thanks for your help, this was really appreciated. Unable to add users to sure signal. I registered my suresignal device s/n 40120246869 14.04.2012 and during 2 weeks I cannot add users (java error messages). I called to tech support and they promised me to add users manually but nothing done. I sent e-mail to the support team - nothing done. Could please gime me any advice? Re: Unable to add users to sure signal. I’m sorry to hear that you have been having trouble adding users. Have you tried using a different web browser (FireFox/Chrome/Opera)? Do you get the same issue? If so, I have sent you a private message explaining exactly how to get in touch with us. I am getting the same problem on two different PCs (Win 7 and Vista) and three different browsers (Opera, IE and Chrome) so it appears to be a server side error. I have tried again just now and the error is still there. The process works up until clicking the final CONFIRM button then I get a screen full of code! Screen shot attached. I too emailed customer support to add a user for me, but nothing happened. How do I resolve this issue?